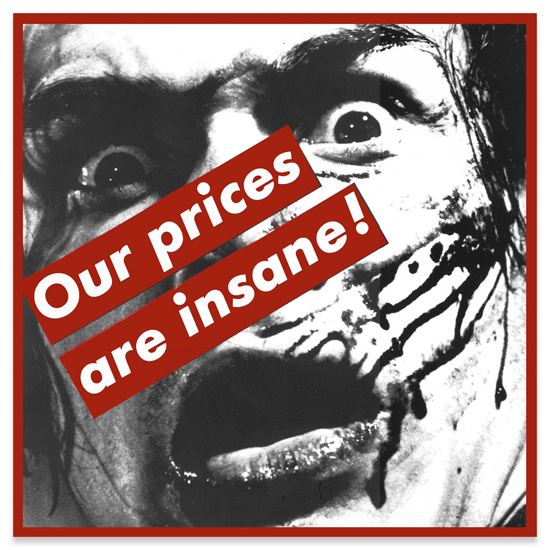 Barbara Kruger, Untitled (Our Prices Are Insane! ), photographic silkscreen on vinyl, 98 1/4 by 97 3/4 in. 250 by 248.3 cm. Executed in 1987. © Images are copyright of their respective owners, assignees or others. Barbara Kruger (b. 1945), got her start in the design department of “Mademoiselle” magazine in the mid-60’s. She is known for her combination of mass-cultural images found in magazines, with her original aggressive text displayed on top, similar in style to mass-advertising and propaganda. Kruger creates aphorisms that question or contradict the image that supports it and undermine the power-relations typically established between text and image in normal consumerist environments. Consumerism is a very popular target of Kruger’s juxtapositions, which attack a shopper’s culture while reinforcing it, focusing more on questions raised rather than proposals for alternatives. She has moved from this confrontational text/image picture to a text/environment relationship that more directly confronts the viewer and the institution that houses the work. Text that blankets the lobby of her 2012 site-specific, long-term installation at the Smithsonian’s Hirshhorn Museum, transforms the museum into the carrier and supporter of phrases like “FORGET EVERYTHING” and “BELIEF+DOUBT=SANTY”. Not just limited to walls, Kruger’s iconic imagery and text have adorned billboards, busses, department stores and t-shirts ceaselessly commenting on the supporting object and environment. Kruger has created permanent installations for the Fisher College of Business, the Broad Contemporary Art Museum at LACMA, the Moderna Museet, Stockholm, and the Price Center at the University of California, San Diego. She is currently represented by Mary Boone Gallery. Her contemporaries and colleagues include Jenny Holzer, Sherrie Levine, Louise Lawler and Richard Prince.